As a UK resident, the Firth of Clyde fishery belongs to you. We therefore think it’s very important that you have a say. Please let us know what the decline of the Firth of Clyde means to you. We’ll publish these on the website, unless you check the box saying you don’t want it published. “In answer to Graham McNair’s questions about juvenile fish. A couple of years ago I was discussing the Clyde with my late friend Prof. Laurence Mee, then Director of the Scottish Assn. for Marine Science. We came to the conclusion that the current biomass in the Clyde is nearly identical to that of the previous decades since data was available. However the species structure has altered. Where cod were once dominant it is now whiting. Also age and size distribution has also changed. If the large members of a species are heavily culled leaving only smaller specimens, these smaller specimens will breed earlier, breeding smaller offspring. An analogy can be drawn with say a shepherd selling his biggest ewes and rams leaving only smaller ewes to breed– outcome is smaller sheep even on the same grazing. Back in the late sixties there were lots of small, undersize whiting in the Clyde. However pair trawling for herring did a lot of damage to this stock of juveniles. In one incident the MOD police boat found a mile long slick of these floating at the mouth of Loch Long. “As a Sea Angler, I don’t think the problem in the Clyde is a lack of fish ….It’s just the size of the fish. During the Summer I fished reglarly down at Custom House Quay, Greenock – At times the water was alive with fish -Species caught over the Summer were Cod, Pollack, Coalfish, Mackeral, Wrasse (Various species) Haddock, Dragonets, Dabs etc. “In 1978 I sold my boat Endeavour TT2 and went to work in the oil industry. My reason was that as a great-line fisher in the summer and cod netter in the winter I could see the imminent destruction of what was a very productive fishery. We worked six to eight inch mesh and never had discards. On our lines we worked 8/0 hooks, never had discards, nor did we destroy the seabed. A very different story from the trawlers and scallopers. For many years I took out anglers, as did others including trawlermen, but greed was what really finished the Clyde. I now lecture in sustainable ecology, mainly in Norway, Greenland and Canada. All places where the lesson of overfishing by destructive methods has been learned the hard way but resolved by going back to basic line and net fishing with static gear. The only way forward is in effect to go backward. I occasionally lecture to students at the Scottish Assn. for Marine Science UHI near Oban and show them what fishing in our inshore waters once was. Line and Net fishing is not the back breaking job it was in my young day so we could return there. Marine protected zones work well in New Zealand and could work well here if we can find politicians who don’t resemble a filleted fish — Spineless and Gutless. Back in the Seventies I asked the sea anglers to back me in fighting against inshore trawling in the Clyde but met little enthusiasm as many of them went out sea angling at weekends on trawlers from Rothesay and Loch Long. “It’s about time that something was done to bring the Clyde back to it’s former self, when it was worth while as a recreational angler to cast a line on the river. That was before it was devastated by commercial trawlers and dredgers killing almost everything on the sea bed, making it all but uninhabitable for most of the fish that used to thrive there. “I too am one of the Ayrshire McCrindles that had the Silver Crest and Aliped fleet which is no more. I used to remember Ayr harbour full of fishing boats, men repairing nets next to the fish market. I used to spend hours watching crates of good sized, healthy fish coming off the boats and the amazing speed of the auctions where I had no idea what the auctioneer was saying because he was talking so fast. The smell of the fish, tons of ice from the ice-house, rust on everything that floated and wooly jumpers and oilskins on everything that walked. My family heritage has gone along with the boats, the ice-house, the market, the nets and the fish. I support revive the Clyde despite knowing we’ll never see the likes again. It brings a heavy heart and I can only imagine a fraction of the heartache my father and the rest of the family and other fishing families must feel at the loss of such an industry and culture. “I am not trying to be a public speaker but I have now been fishing for about 50 yrs so feel qualified to speak out regarding our local fishery (The Clyde). As a young boy my fishing was restricted to family day trips out to Saltcoats and Ayr with no family car we travelled by train and hoped I could get on a day boat. As there were so many I managed it most times and in 1974 out of Salcoats I caught a 13lb cod from an old open wooden boat for the cost of £1.50 per trip. I also caught many just under DOUBLE FIGURES from the first MARION B boat owned by Tony Medina in Ayr bay a couple of miles out. I was then lucky to have a friend of my uncle called Rab Grainger take me shore fishing at Portincaple most weekends or from the Gourock boats as part of a works trip. The places were alive with fishermen looking forward to another successful trip. Cod after cod, some whiting, flatties, conger . I now feel guilty AS I THOUGHT IT WOULD NEVER END. I became a small boat owner fished from Clynder to Inverkip trying to relive the past but it was getting harder as years went on . I am sure many of you can relate to all the above. I have wanted to know for years what divers would find on the sea bed of the Clyde and now we are told it is a barren version of a ploughed field. Nature is trying its best to help and it is amazing how quickly the situation can change if we stop interfering and causing an imbalance as there are signs of fish being caught and returned when possible so all commercial fishing must stop now and allow cod to reach maturity to breed and generate future stocks.other areas like the Mersey have excellent shore and boat fishing with charter boats for hire. up as langbank cod were in abundance. Having fished the last few years using same bait etc as done in the past -what have they done to this great fishing river? Well the trawlers have fished it to a point that the fish are so scarce and practically non existent .Well now I tell my kids how good it used to be and don’t know if it will ever return to what it was. What have they done to our Clyde – why have government ministers just let this continue.The decline of fishing stocks in the Clyde is so sad – why didn’t someone do something before it got to this point? Maybe this sounds a bit bitter but did trawlers have to fish our Clyde and wipe out fish stocks till it got to this point. People around the world campaign about wildlife and different species but they have cleared out the Clyde without to much of an eyebrow raised. What a tragedy. “”””so sad but no one is shore fishing because there are no fish to be caught , Ayr pier in the 1970s and early 1980s was alive with fishermen of all ages catching all sorts of species. Over fishing by the trawler men led to the collapse of the fishing. I worked and saw at first hand the landing and sale of illegal undersize fish sent to Spain. “Having just watching the landward episode on prawn fishing, it is clear to see that we do have a declining stock issue. It is clear to see the Clyde is a barren wasteland, when one looks at their fish finder. Being a recreational angler myself (that releases 90% of catch alive), a glance at the sonar reveals a flat barren sea bed. There is little life, and finfish nursery habitats have been decimated. Have a look at the Clyde angling charters, there are NONE! 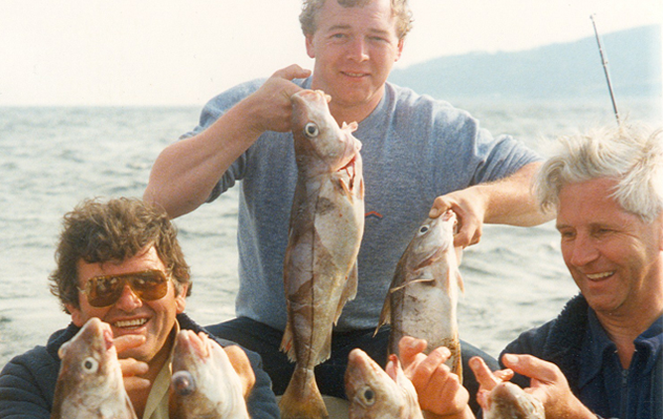 The Clyde was once a prolific cod breeding ground, home to massive fish. The only cod I see from the Clyde measure the length of my pinkie finger. “”Been out all day today off the Wee Cumbrae and never got as much as a bite. (probably wrong tide and time of year). I will soldier on as last summer give me hope after landing several large cod again off Wee cumbrae. I don’t know if it will ever be as good as it was 30yr ago but i will enjoy trying to find out!! “My Family The McCrindle family of South West Ayrshire have been connected with the Sea Fishing Economy for over 150 years or more. My brother was the last to make a living at sea but had to quit to provide a steady income for his family. It makes me sad that this Industry and a healthy fish stock has gone. I hope that this initiative can help the Clyde become a place for fish and man to survive in mutual respect and we can all enjoy the benefits of what is a part of our inherited culture. “Having moved from Kilmarnock to Ayr during my school years I cherish fond memories of Ayr Harbour and the nearby shorelines particularly the Newton. There was a stark difference between a landlocked town and the new experiences, sights and the smells associated with the Sea. The bustling Ayr fish market was a spectacular event fuelling the imagination and inspiring the mind as to the diverse range of species which live in the Sea. An interest in fishing developed locally and progressed to some of the favoured marks along the Clyde Coast for favoured species such as Codling. - John J Green snr. “Scenery, proximity and accessibility of the islands by boat, both ferry and own vessels. “As a teenager 4-5 of us would escape the schemes and gangs at the weekend and head down to Helensburgh on the blue train. We would then either walk or chap a lift to Rhu and beyond [though we found out the hard way that it was probably going to be a single journey at Coulport once lol] We never caught much but that didn’t matter, we were away in the fresh air away from trouble. I always look back on those days and realise that we were learning to stand on our own two feet, we never made a mess and kept ourselves to ourselves. No drink of course, that would interfere with the fishing! “It’s very, very sad that the fantastic fishing in the Clyde Estuary has been lost. The potential for the Clyde Estuary is huge and we have the chance to change that. Unfortunately, the current style of commercial fishing in the Clyde is totally destructive to the eco-system in the Clyde and it’s time people stand up & take action to reverse this situation before the Clyde is completely sterile of fish (almost at this point now). I know people are still earning a living on the Clyde (shellfish), but they are destroying it for everyone else. The financial potential (from leisure fishing) in the Clyde system is huge and would benefit hundreds, if not thousands, of people rather than just the few (few dozen at most) who profit from the shellfish at present. The Scottish government must take action IMMEDIATELY. “The Firth of Clyde is home to me. I love it dearly. I am very sad that it has been so exploited and damaged. I was born a couple of years before the war and brought up in Glasgow. The Clyde was the shipyards, the Princes Dock and the Govan ferry. To avoid the bombs we moved from the city to Rothesay. Magic! The war was still there, the Cyclops was in the bay servicing the submarines. but we had steamers and the Pier. And if you went to the pier and walked down the steps where the navy boats unloaded and looked down into the water – you could see fish! Swimming about. Under the pier. More magic! I wasn’t old enough to go to school but I got a hand line and some musssels off the shore. Thrill of a lifetime. You could see the wee Saith darting for your bait – Tweek – tweek – Got it! Yes but it got me. I became a fisherman. We support sustainable fishing of Inshore water with the use of Creel . “The Firth of Clyde still has a flourishing fishing industry and the fish stocks are on the way up as recent surveys have shown. This is much to the actions of the Clyde fishermen themselves, due to gear set up and methods used. For the claims that scallop trawl has annihilated the fish stock is a joke. Scallop gear doesn’t catch round fish, in fact the act of scallop trawl results in feeding for fish. The fishermen that fish The Clyde have done so for generations and its not in there interests to annihilate anything. Like most of my fellow small community fishermen around The Clyde we are 3, 4, and 5 generation fishermen and there businesses have never being more viable than in the last five years. “What we see in the Clyde is an example of the damage that can be done, – to coastal estuaries, the sea and in turn our oceans by man; by polluting it, over fishing it and using it for heavy commercial industries without giving a thought for the very thing that created it in the first place…its ecosystem. The Clyde has hit a low in terms of heavy industry, the commercial finfish industry has all but collapsed and now at last we are becoming more responsible with what we put into it…the old west coast term, “Tip it in the Tide” is becoming out-dated. BUT will we do something about it in time to save the Clyde and beyond?